"...The Germans on higher ground on the north bank of the Neder Rhine could spot their firing positions and sent in counter battery fire, that killed Fernan and wounded others..."
Killed in Action on 4 November 1944 behind the main dike, east of Heteren, the Netherlands. He was the son of Leo P. and Ester M. Fernan, of Elmira, NY. They lived at 959 Oak St. Fran had a brother named Richard J. Fernan, who served in the Philippines and New Guinea. Richard survived the war and returned home to his wife, parents an two sisters Margaret and Marian (mother of this contributor, Diane Knechtges. *) His father worked as on the Delaware, Lackawanna and Western (DL&W) railroad. Fernan was a very strong soldier and he was shot by a military policeman during the riot in Charlotte N.C. in 1943. He disarmed the M.P. but was wounded in the leg. He didn't turn himself-in for medical attention until about 4 days later, when his wound became so serious that he could no longer drill with his platoon. The Charlotte riot happened when members of a Filipino U.S. Army unit fought with parachutists from the 501 in the town of Charlotte. He was a high school athlete and was from Elmira, NY. He was a member of the 81mm mortar platoon of HQ Co. 2d Bn. 501 PIR. His original platoon leader was Lt. William Russo. The 81mm platoon leader at the time of Fernan's death, was another Lt.,(Alton Phipps) who allowed the mortars to be dug-in too far behind the main dike at Heteren. The Germans on higher ground on the north bank of the Neder Rhine could spot their firing positions and sent in counter battery fire, that killed Fernan and wounded others. Fernan landed on Drop Zone 'D' near Angoville au Plain, France, on the Normandy drop. He fought between Angoville and St Come du Mont on the first 3 days of the Normandy Invasion, then was in the attack on Hill 30 southeast of Carentan, on 12 June, 1944. The rest of the time in Normandy combat was spent in the area south of Carentan, near la Billonnerie. Fernan parachuted into Holland on 17 Sept., 1944 and was in the fighting to hold Veghel from 17- 28 September, 1944. After that, things quieted down in that sector of Hell's Highway and the 501 moved north to the Betuwe, near Heteren on 4 or 5 October, 1944. They remained in defensive positions along the main dike there, until late November, when the 501 was withdrawn to Mourmelon le Grand France. 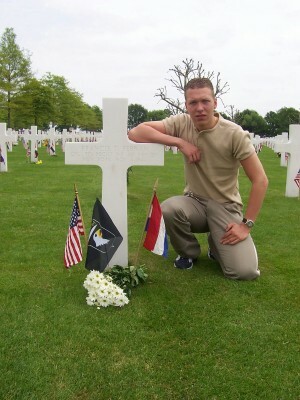 Fernan was KIA behind the main dike, east of Heteren, earlier in November. * 12 December 2004...Additional information supplied by the niece of Francis T. Fernan, Ms. Diane Knechtges. We wish to thank Ms. Knechtges for her very kind information and photograph regarding her late uncle. The materials depicted on this page were reprinted with kind permission of Mr. Rick Mommers of Voerendaal, The Netherlands. We, at the World War II Stories - In Their Own Words web site wish to offer to Mr. Mommers our most profound THANK YOU for his service in tending the final resting places of some of the young soldiers who gave their lives in the liberation of Europe -- during World War II and especially for allowing us to share those memories. We will always be grateful for Mr. Mommers' contributions in helping to world remember the deeds done by young men, not much older that he so many years ago. Original story transcribed from an e-mail message received beginning on 19 July 2004.